Yoga and meditation are both amazing tools for living a more fulfilled life and for self-realisation. But along the way to self-realisation, there are many hurdles and obstacles to overcome. Yoga practice can help transcend not only physical limitations of a human body, but also teach us to deal constructively with psychological challenges, one of which is stress. Stress response initially formed as a function of a body that is designed to protect us from harm. Stress response mobilises the "fight-flight-freeze" response which enables a human or an animal to fight against the object of danger more effectively or to run away faster. It literally makes our stored up resources available to be able to use them in a situation where they might save our lives. In our time and age, most of the situations and people that trigger a stress response in us, are not actually threatening our lives. Our work circumstances, finances, studies and unpleasant people can surely be a cause of stress, but we tend to overreact. And if stress response becomes our default way of dealing with difficult people or life's challenges, we begin to overexert the resources that are meant for truly threatening situations and to overproduce the stress hormones on a regular basis. If as the result of chronic stress, the hormones like cortisol and adrenaline continue to be released into the blood stream and to circulate through it, they become toxic and can lead to disease. Chronic stress sabotages the endocrine, digestive and cardiovascular balance. It shifts the body PH from slightly alkaline to acidic, increasing the risk of inflammation, as well as the risk of diabetes, ulcers, eating disorders and skin conditions to mention a few. 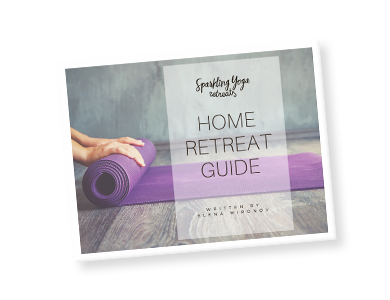 I have prepared a few simple yoga poses practicing which may help you keep the stress effects under control and help you rest easy and feel more calm and relaxed. This resting pose helps to calm, ground and centre, soothing the brain and making it a therapeutic posture for relieving stress. When performed with the head and torso supported, it may also help to relieve back and neck pain. On a physical level, child's pose helps to stretch the hips, thighs, and ankles while relaxing the digestive tract and the vital organs and reducing stress and fatigue. It gently relaxes the muscles on the front of the body while softly and passively lengthening the muscles of the back torso. Child's Pose is a simple way to relax and calm your mind, slow and deepen your breath, and restore a feeling of peace and safety. Practicing the pose before sleep can help to release the worries of the day. Practicing in the morning can you help ease the transition from sleeping to waking. 1. Begin on your hands and knees. Choose to keep your knees together or spread your knees wide apart while keeping your big toes touching. Rest your buttocks on your heels. 2. Bow forward, resting your torso on top of your thighs or between them. Allow your forehead to come to the floor as you extend your arms along the sides of your body. Alternatively, place one forearm on top of the other and rest your forehead on your forearms. 3. Let your upper back broaden. Soften and relax your lower back and your face. Allow all tension in your shoulders, arms, and neck to melt away. 4. Keep your gaze and your awareness drawn inward, your eyes softly closed. Center your breath, and let your thoughts slow down. 5. Stay in the pose for 3-5 minutes breathing softly to experience the stress relieving benefits of the pose. Bridge pose helps to calms the mind and release stress. It is also therapeutic for individuals with high blood pressure. It increases lung capacity, opens the chest, heart, and shoulders. It stretches the spine, the back of the neck, the thighs, and the hip flexors. Slow down, listen to your body and notice that the less you push, the more the pose opens up. Turn your attention inward and notice how your body releases its grip when you are not forcing it. Bridge Pose is considered a mild inversion. It is a lot less strenuous than other inversions, such as Headstand, and holds all the benefits of inversions. It helps to relieve stress, anxiety, fatigue, headaches and insomnia. 1. Lie on your back with your knees bent and feet on the floor. Press your elbows into the floor and point your fingers upwards. 2. Press your feet and arms firmly into the floor. Lift and spread your toes. Exhale as you lift your hips toward the ceiling. 3. Draw your tailbone toward your pubic bone and pubic bone to navel. 4. Roll your shoulders back and underneath your body, bring your inner shoulder blades together. 5. Keep your thighs and feet parallel. Distribute your weight evenly across all four corners of both feet. 6. Hold for up to one minute. To release, slowly roll your spine along the floor, vertebra by vertebra. Allow your knees to drop together once you've come out of the pose. Standing forward bend releases tightness in the lower back and lengthens the muscles that run along the spine. The standing forward fold bend is a great stress and fatigue reliever. The pose reverses the tightness in the shoulders and fosters calmness and tranquility. The benefits of the standing forward fold on the digestive system are many, and include strengthening the liver and kidneys and balancing the digestive tract. Standing forward fold is a natural antidote to stress, depression and fatigue. All of these benefits contribute to better quality sleep. 1. Stand straight on a yoga mat with feet hip-width apart. Fold the upper forward from the hips and relax the head and neck completely. Keep the legs slightly bent or, if your hamstrings are tight, bend the knees a lot, resting the chest on the thighs. Rest the fingers softly on the floor, and breathe deeply. 2. Stay in the first variation, or alternatively, place your hands on the opposite elbows and let gravity lengthen your back and spine. 3. As a third variation, hug the legs in, reaching the arms behind the elbows and catching the opposite elbows with your hands. Fold deeply, root into your feet, and try to soften your face, backs of the eyes, back of the throat and the entire back body. 4. Stay in the pose for about a minute, then slowly roll up to stand or rest in a child's pose. 1. Gently elevate the legs up the wall, either keeping the lower back on the floor or placing a folded blanket under it. 2. Let the legs rest in a vertical position, or alternatively open them into a straddle. If preferred, one more alternative is cobbler pose legs - feet together and knees open. 3. Let your arms rest on your belly or out to the sides. 4. Focus on your breath. Taking a deep, slow inhale through your nose and a deep, slow exhale through your nose. 5. Try to stay in the pose for at least 5 minutes. 6. To come out of the pose, bend your knees, roll to the side and off the bolster or blanket. Come up to sit through your side. Improves posture and balance, strengthening and stretching the spine and neck, the hips, abdomen and back. The pose massages and stimulates organs in the belly, like the kidneys and adrenal glands. Cat cow pose contributes to emotional balance, relieves stress and calms the mind. 1. Start on all fours. Align the hips with the knees and wrists with the shoulders. 2. Breathe in as you arch the back, pull the shoulders away from the ears, lift the tailbone. Let the inner edges of the shoulder blades come very close together. 3. 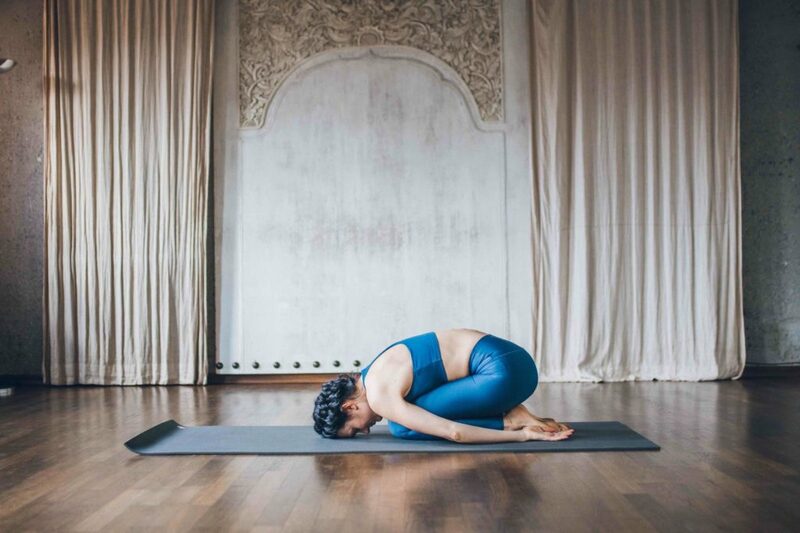 Breathe out as you begin to round the back, letting the chin come closer to your chest, shoulder blades moving apart on the back body, tailbone curling towards the knees. 4. Repeat as many times as you wish, maintaining the breath awareness and letting the movement synchronise with the breath. Complete this calming practice with 15-30 minutes on practicing yoga nidra - one of the most effective meditations to help you de-stress, calm down, slow down your mental chatter and prepare for sleep. This is actually the only meditation technique capable to shift your brain into delta brainwave state which corresponds to the deepest state of sleep that exist.